Figuring out how to repel mosquitoes in backyards and other outdoor venues is always a challenge, especially if you want to avoid using chemicals that could hurt children, pets or grass and plants. Fortunately, there are a number of solutions that have at least some effect. They may not get rid of every single mosquito, but they can make a big difference. First, let’s just state the obvious. There’s not much question that DEET is pretty effective, and some people claim it’s quite safe to use – provided you follow an intimidating set of instructions on how to use it. But even if you’re perfectly comfortable using DEET, it’s only designed to be applied to the skin. It won’t keep mosquitoes from buzzing around you – or from biting guests who didn’t wear a repellant and don’t want to use yours. How, then, can you minimize, if not eliminate, the number of mosquitoes annoying you and your guests or friends in an outdoor setting? There’s a relatively new chemical repellant for skin called Picaridin. 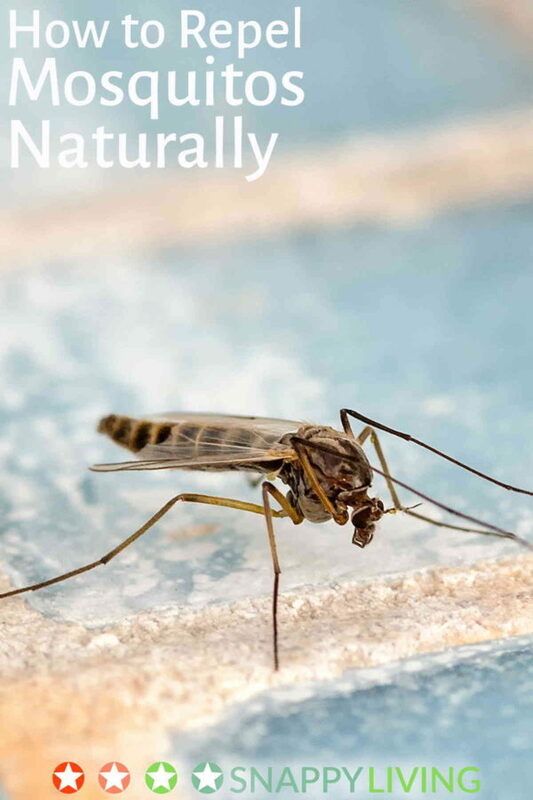 While it’s not “natural”, it’s just as effective as DEET without some of the worrying effects like melting plastic. If you want to be absolutely sure to avoid mosquitos and/or ticks, products like Sawyer’s Picaridin Lotion can be a good option. Now onto the purely non-chemical options! First, do what you can to avoid attracting mosquitoes in the first place. 1. Keep your lawn trimmed and dry. Standing water and tall grass or weeds attract mosquitoes and other insects. 2. Clean your gutters, eavestroughs and anything else that might let water pool or stand. 3. Landscape to avoid puddles. If your yard tends to collect puddles in certain areas, a little bit of landscaping will change that forever. You need to add soil to level out the depressed areas where the puddles collect, and then create a slope at the front or back of the yard for water to run off. While you can hire a contractor for a big job, you can easily just fill in depressions with some top soil, put down some grass seed, and make sure it gets water daily until the seed starts growing. Now that you’ve made your yard a bit less attractive to mosquitoes, you should be seeing less of them. But the above steps probably won’t be enough. It’s time to look at mosquito repellant measures. I’ve looked at a ton of online recommendations, and there’s only one solution that has really solid science behind it. The rest are folk remedies. Some people claim great success with them, but others find the same methods ineffective. My guess is that some of these solutions may actually work on some mosquitoes in some certain conditions, but different species of mosquitoes or different conditions render them useless. You can buy a bat house inexpensively. This is a little box you mount in the fall or winter within a few hundred yards of a stream, river or pool. By summer, with some luck, you’ll have bats living in it, and each bat can eat several hundred mosquitoes. Getting this started can take some tinkering. You may not attract bats immediately, and find you need to change the placement of your box. But there’s no question that bats eat mosquitoes, so if you manage to get them coming around your home, they will drastically reduce, if not eliminate, your mosquitoes. Since bats naturally prey on mosquitoes and won’t hurt other creatures or your plants, this is probably the most effective natural way to repel mosquitoes. And you won’t have bats buzzing your head in the evenings or anything – they prefer to avoid humans whenever possible. Several plants have the proven ability to repel mosquitos, but not over a large distance. Try planting basil, lantana, lavender, lemon balm, lemon thyme, lime basil, and stone root in your favorite backyard spots. You’ve probably heard that citronella repels insects including mosquitoes, but it turns out that’s not true. It’s probably not even true that citronella oil, extracted from lemongrass, repels insects. And yet, if I’m being honest, I have had both citronella candles and “mosquito plants” (a type of geranium that produces citronella), and I thought they helped a little. Eucalyptus actually works, at least when applied to the skin. You can buy commercially made eucalyptus based repellants. How much these repellants help, when sprayed around the yard or added to tiki torch fuel, is unknown. Mosquitoes avoid both smoke and flame. But the area just outside a plume of smoke? That’s perfectly comfortable for mosquitoes. So unless you are actually within a plume of smoke, candles (citronella or otherwise), fire pits, incense sticks and tiki torches are not really helpful. The main problem with bug zappers is that mosquitoes don’t find them attractive. The secondary problem is that they destroy beneficial insects who might, ironically, keep your mosquito population down. There are systems called Mosquito Magnets which are supposed to attract, then kill, mosquitoes. They cost anywhere from about $250 to over $700, depending which one you choose. They also need the repellant and other components replaced frequently (also not cheap). They get mixed reviews from users. Some people think they’re terrific. Some people find them effective, but not worth the price. My take on all this is that the bat house is your best solution. It may take some patience up front, but once you get it working, it’s maintenance free and absolutely harmless – you’re just conveniently relocating a natural ecological function (bats eating mosquitoes) to your yard. If your problem really isn’t that big, and you feel the bat house is more trouble than you want to go to, then just settle for the protection of topically applied repellents – you have the choice of DEET-based ones or the ones with eucalyptus. I have not personally used any of these listed, but I read these online, which might or might not be helpful. In any event, some of them can be used in foods , while others will provide pretty flowers . You could try 1 or a combination of several around your yard. Thanks Steve, that’s really interesting. I grow several of those in a little herb garden, and now that you mention it, I never see mosquitoes around those plants. Great find!